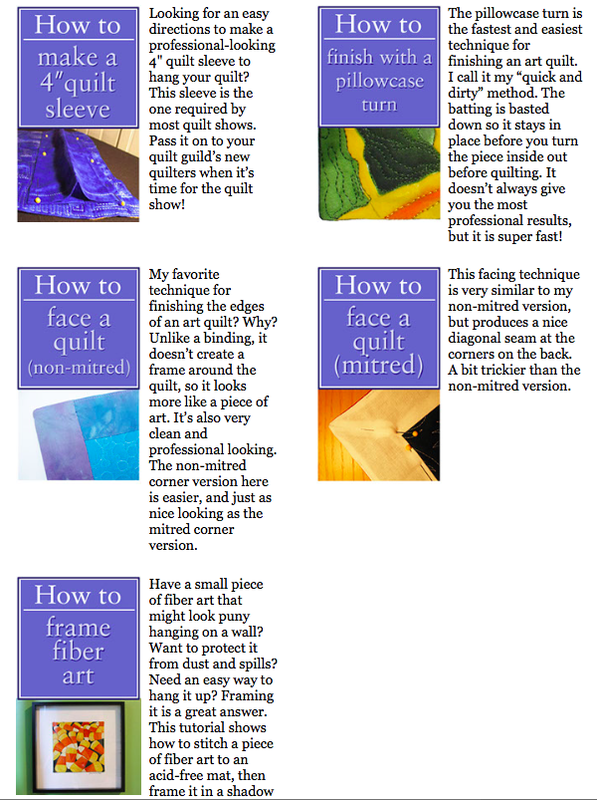 Here are some fabulous links (divided into two sections) to give you some inspiration when it comes to finishing off the edges of your art quilts as well as embellishing them. Finishing off the edges of my pieces is my least favorite part and sometimes the piece will sit for a very long time until I get re-inspired to do that last step! Some of these have helped me through that process! I hope they help you as well! I'm learning more and more about embellishing the pieces with beads, fringe, embroidery and more so I have added the section called EMBELLISHMENTS below this section. So much to see and learn! 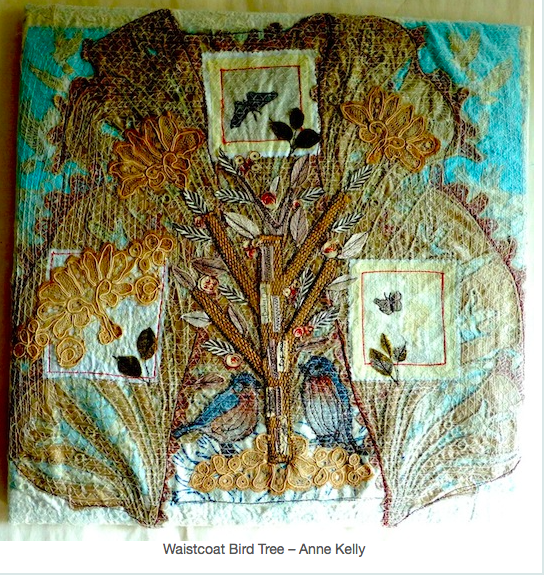 Susan Carlson show us how hang our art quilts, stretch it on a canvas or frame it in this fabulous BLOG post! She is an inspiration! CLICK on photo to go directly to her blog post. 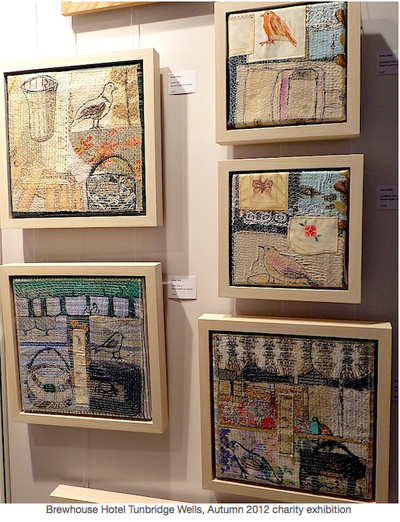 WRAPPED CANVAS: Judy Simmons shares the museum wrap or canvas wrap on her blog. She is very detailed and use lots of photos! A great way to display your pieces. Thank you Judy! Click on photo above! BLANKET STITCH PLUS: Unique finishing with a blanket stitch and accent taught by Laura Wasilowski! This method really adds a fabulous detail and accent to your piece. CLICK on photo. Thank you Laura! FUSED BINDING! 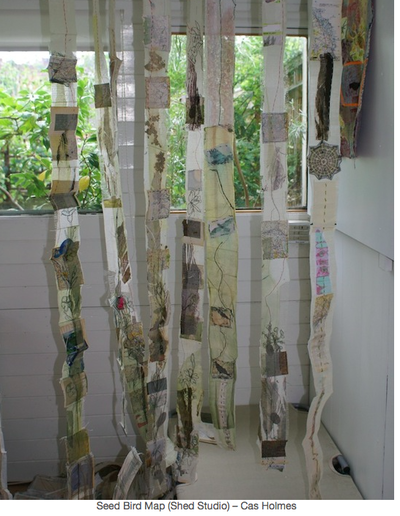 Laura Wasilowski shares how she fuses the binding on her pieces. One of my new favorites! Click on photo above! Thanks Laura! Susan Brubaker Knapp's website is beyond inspirational! This one link has everything you need to know. 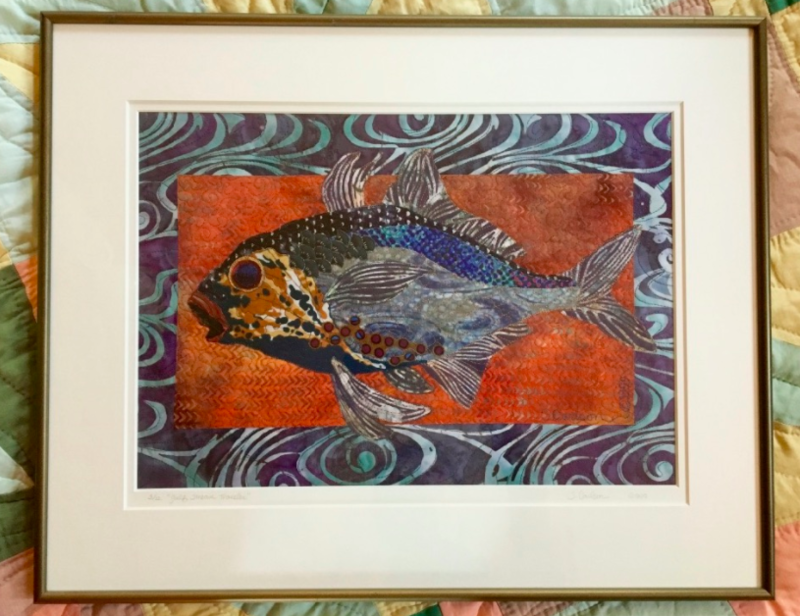 How to Make A Sleeve, How To Face a Quilt (mitered and non-mitered), How To Frame Fiber Art and How To Do the Pillowcase Turn. CLICK on above photo to go to the page with all 5! Thank you Susan! RAW WRAPS, DOUBLE-FOLD BIAS, SATIN STITCHING: FREE from Quilting Daily. "Download this free eBook to learn how to successfully bind your quilts using techniques such as raw wraps, double-fold bias, and satin stitching. 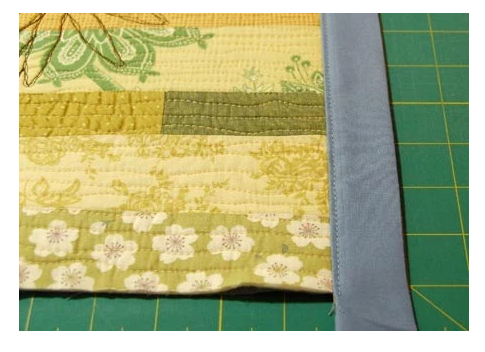 Have you ever thought of binding quilts with couched yarn? Check out the included tutorial to see the beautiful results this technique has to offer. Now get ready to finish your quilt with professional flair, including creating a gallery wrapped canvas or an invisible quilt sleeve. Whether you are looking for ideas for a more sturdy binding, one that is more decorative, or even professional tips for hanging, you’ll find them all in this free collection." CLICK on photo to access! 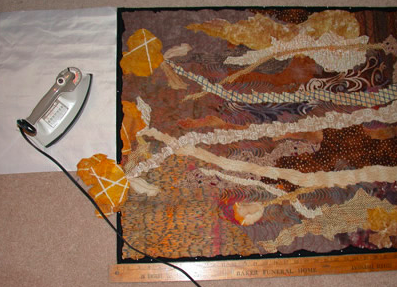 BLOCKING YOUR QUILT: Ellen Lindner teaches us how to make quilts lie flat. Here is the link to Part 1 in Blocking. Part 2 follows. Thanks Ellen! Click on photo above to go directly to Ellen's site. How To Hang Your Quilt: Small triangles in the top corners is one method! Beth Ferrier from Craftsy shares this method and shows us how in this video. Thank you Beth! Click on photo to go directly to the video. Zig-Zag binding! Terry Grant figured out a way to make a nice, neat zig-zagged edge on her little pieces in lieu of a binding. Love this. Lots of photos too. Thank you Terry! 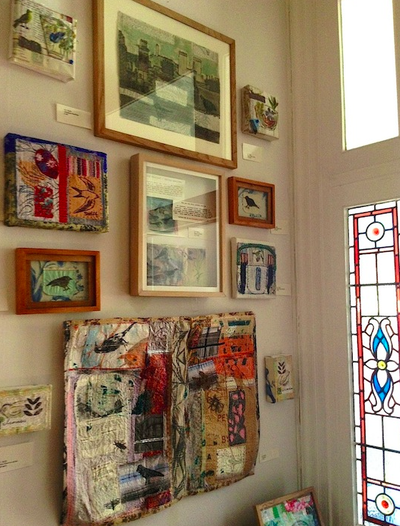 Mounting art quilts on plexiglass! Very brief but interesting. Melody Johnson mentions how to mount your piece using plexiglass. It's like sewing a button. Click on photo to go directly to her page. Finishing the back of a piece you want covered like a hoop. Here is the link to SewMamaSew's page that tells you how to cover the open back of a hoop but it can work for other things as well. I like it! CANVAS wrap: another tutorial which includes a different method and shows step by step how to finish the edges perfectly! Lots of photos! CLICK on photo to go to Modify Tradition! Ann Kelly shares her expertise advice on hanging and displaying textile art in this article from TextileArtist.org. So many wonderful photos and ideas with information on Cas Holmes book Connected Cloth! Click on photos to go to the article and enjoy! A binding all done by machine just like in the photo. Two fabrics at once! A unique technique shared here by Aunt Marti. Click on photo. This is something I tried while making up the samples for my patterns. 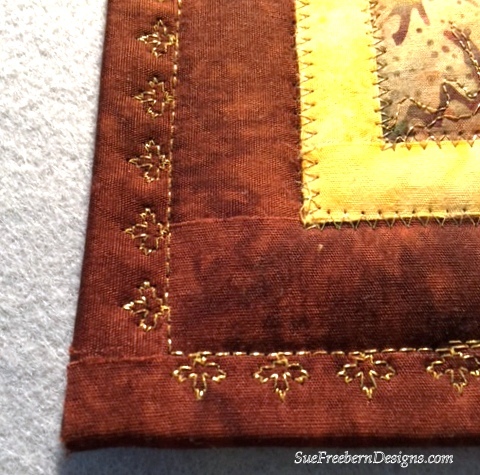 It's a fusible binding and then I used one of my decorative stitches along the edge! Click on photo to go to my post with more info. WRAPPED edge binding. I love this and it's my new favorite. 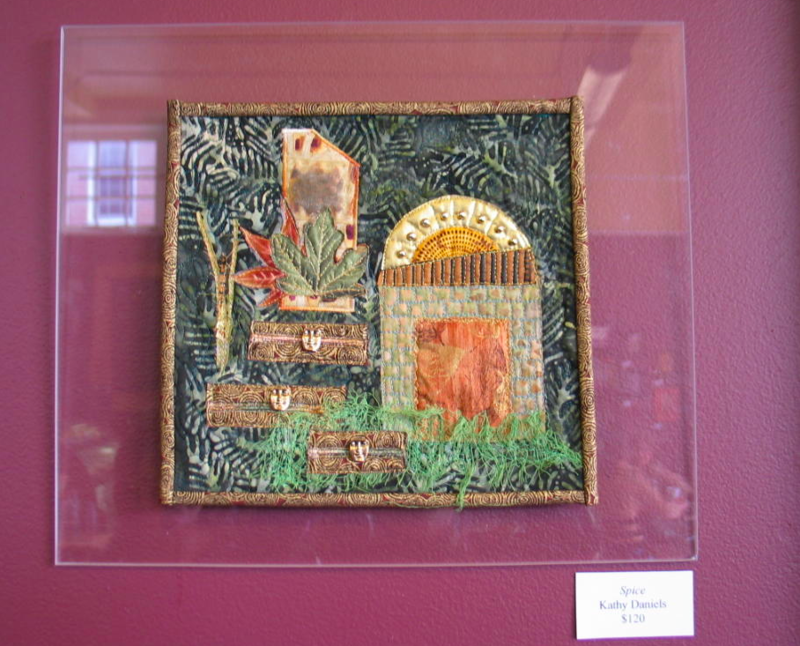 Susan Carlson explains how she takes scraps and wraps the edge of her pieces with them. She uses glue to hold the scraps down on the front and back. I've tried it and love it! See my blog post...wrapped edge binding! YAY! CLICK on photo to go to a preview of her book Serendipity. See page 46 Libris Sol for one of the examples of the wrapped edge binding. Nancy Zeiman asks us "Are you notorious for saving fabric scraps? Use those scraps to make variegated bias tape, trim, or binding by choosing three or more compatible coordinating fabrics. 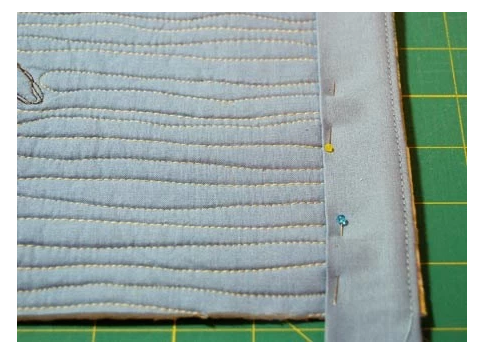 Sewing the strips together in a staggered or offset fashion creates a Barber Pole binding effect. This technique transforms even small fabric pieces into eye-catching finishes." Thank you Nancy! 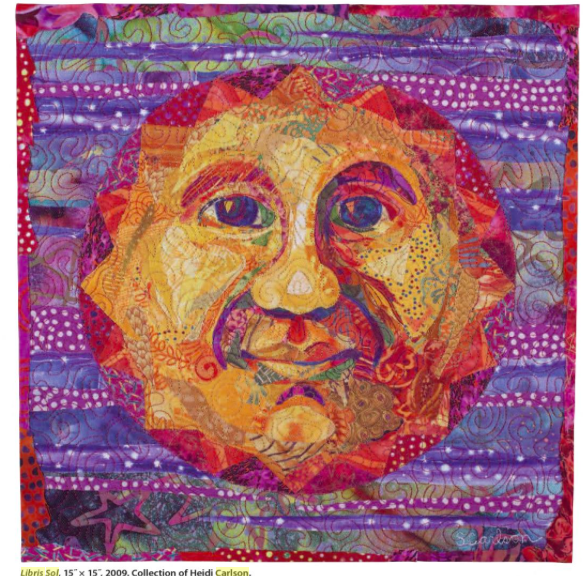 From Quilting Arts! A free eBook on different ways to bind your piece. One The Edge, Not Bound By Tradition, A Big Finish for Your Small Quilt and Picture it Frames! Each with it's own directions! Thank you Quilting Arts! CLICK on photo! 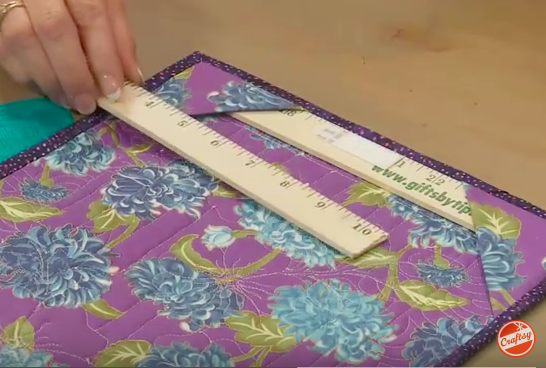 A hidden quilt binding tutorial from Nancy Zieman! Sometimes borders make the piece feel confined and you don't really want an edge on it so here is one way to solve that. Click on the above photo to go to Nancy's tutorial! Thank you Nancy! Knife Edge Binding by Anita at Bloomin' Workshop. Anita shows us how to do this binding that does not show from the front at all. Some call it Facing and some Invisible binding. I like the ways she shows us how to do it with photos and text. Thank you Anita! CLICK on photos to go right to her site. 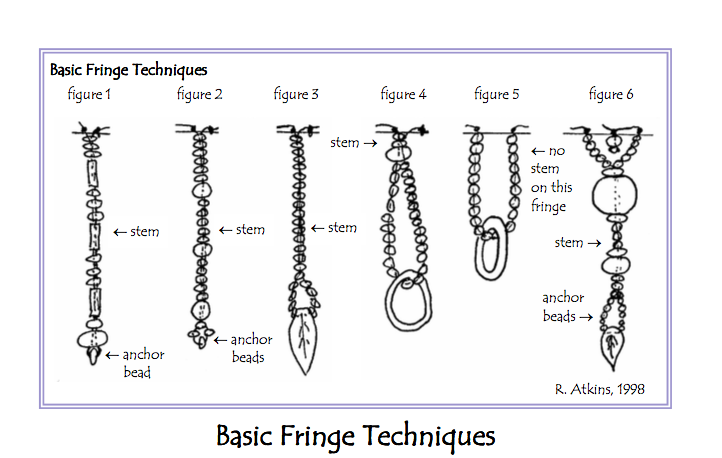 This FREE eBook/document by Robin Atkins tells you all about beading but in the last section (pg.53) she includes instructions for adding fringe! Thank you Robin! Click on photo! BEADING! FREE eBOOK from Robin Atkins! 59 pages full of examples and tutorials (includes FRINGE). Print out or view online. What else could you possibly need! Thank you Robin! CLICK on photo to go to eBook in PDF and give it a minute to load! ENJOY! FREE eMagazine! A fabulous and very inspiring FREE eMagazine with loads of stitches and ways to add embroidery to your piece. I have never seen such beautiful stitches. This wonderful eMagazine even has sections based on themes such as trees, shrubs, vines, grasses and weeds, botanical flower shapes, underwater shapes and corals and more. ​TIP: Click full screen when you access and when you "scroll" on your mouse it should zoom into the page! NOTE: This free eMagazine can always be found on my website under BINDING/FINISHING. The top section is the links to BINDING/Edging and How To Display your pieces and the bottom section is for all the links for Embellishments. ENJOY! Sign up for my Newsletter. Don't miss a thing!